Definition at line 440 of file lluuidhashmap.h. Definition at line 476 of file lluuidhashmap.h. References LLUUIDHashMapIter< DATA_TYPE, SIZE >::mCurHashMapNodeNum, LLUUIDHashMapIter< DATA_TYPE, SIZE >::mCurHashNodeKey, LLUUIDHashMapIter< DATA_TYPE, SIZE >::mCurHashNodep, LLUUIDHashMapIter< DATA_TYPE, SIZE >::mHashMapp, and NULL. Definition at line 485 of file lluuidhashmap.h. References LLUUIDHashMapIter< DATA_TYPE, SIZE >::reset(). Definition at line 531 of file lluuidhashmap.h. References FALSE, LLUUIDHashMapIter< DATA_TYPE, SIZE >::mCurHashNodep, and TRUE. Definition at line 502 of file lluuidhashmap.h. References i, LLUUIDHashMapIter< DATA_TYPE, SIZE >::mCurHashMapNodeNum, LLUUIDHashMapIter< DATA_TYPE, SIZE >::mCurHashNodeKey, LLUUIDHashMapIter< DATA_TYPE, SIZE >::mCurHashNodep, LLUUIDHashMapIter< DATA_TYPE, SIZE >::mHashMapp, and S32. Definition at line 537 of file lluuidhashmap.h. References i, mCount, LLUUIDHashMapIter< DATA_TYPE, SIZE >::mCurHashMapNodeNum, LLUUIDHashMapIter< DATA_TYPE, SIZE >::mCurHashNodeKey, LLUUIDHashMapIter< DATA_TYPE, SIZE >::mCurHashNodep, LLUUIDHashMapIter< DATA_TYPE, SIZE >::mHashMapp, LLUUIDHashNode< DATA, SIZE >::mNextNodep, and S32. Definition at line 452 of file lluuidhashmap.h. 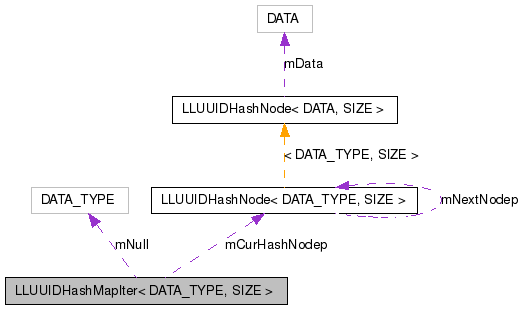 References LLUUIDHashMapIter< DATA_TYPE, SIZE >::mCurHashNodeKey, LLUUIDHashMapIter< DATA_TYPE, SIZE >::mCurHashNodep, and LLUUIDHashNode< DATA, SIZE >::mData. Referenced by LLUUIDHashMapIter< DATA_TYPE, SIZE >::operator->(). Definition at line 456 of file lluuidhashmap.h. References LLUUIDHashMapIter< DATA_TYPE, SIZE >::operator *(). Definition at line 491 of file lluuidhashmap.h. References LLUUIDHashMapIter< DATA_TYPE, SIZE >::mCurHashNodep, LLUUIDHashMapIter< DATA_TYPE, SIZE >::mHashMapp, and NULL. Referenced by LLUUIDHashMapIter< DATA_TYPE, SIZE >::~LLUUIDHashMapIter(). Definition at line 465 of file lluuidhashmap.h. Referenced by LLUUIDHashMapIter< DATA_TYPE, SIZE >::first(), LLUUIDHashMapIter< DATA_TYPE, SIZE >::LLUUIDHashMapIter(), and LLUUIDHashMapIter< DATA_TYPE, SIZE >::next(). Definition at line 466 of file lluuidhashmap.h. Referenced by LLUUIDHashMapIter< DATA_TYPE, SIZE >::first(), LLUUIDHashMapIter< DATA_TYPE, SIZE >::LLUUIDHashMapIter(), LLUUIDHashMapIter< DATA_TYPE, SIZE >::next(), and LLUUIDHashMapIter< DATA_TYPE, SIZE >::operator *(). Definition at line 463 of file lluuidhashmap.h. Referenced by LLUUIDHashMapIter< DATA_TYPE, SIZE >::done(), LLUUIDHashMapIter< DATA_TYPE, SIZE >::first(), LLUUIDHashMapIter< DATA_TYPE, SIZE >::LLUUIDHashMapIter(), LLUUIDHashMapIter< DATA_TYPE, SIZE >::next(), LLUUIDHashMapIter< DATA_TYPE, SIZE >::operator *(), and LLUUIDHashMapIter< DATA_TYPE, SIZE >::reset(). Definition at line 462 of file lluuidhashmap.h. Referenced by LLUUIDHashMapIter< DATA_TYPE, SIZE >::first(), LLUUIDHashMapIter< DATA_TYPE, SIZE >::LLUUIDHashMapIter(), LLUUIDHashMapIter< DATA_TYPE, SIZE >::next(), and LLUUIDHashMapIter< DATA_TYPE, SIZE >::reset(). Definition at line 468 of file lluuidhashmap.h.